September 7 | 2018. Saguenay Fjord Excursion. | Peter M. Schloss | J.D. - Mediator. September 7, 2018. Saguenay Fjord Excursion. 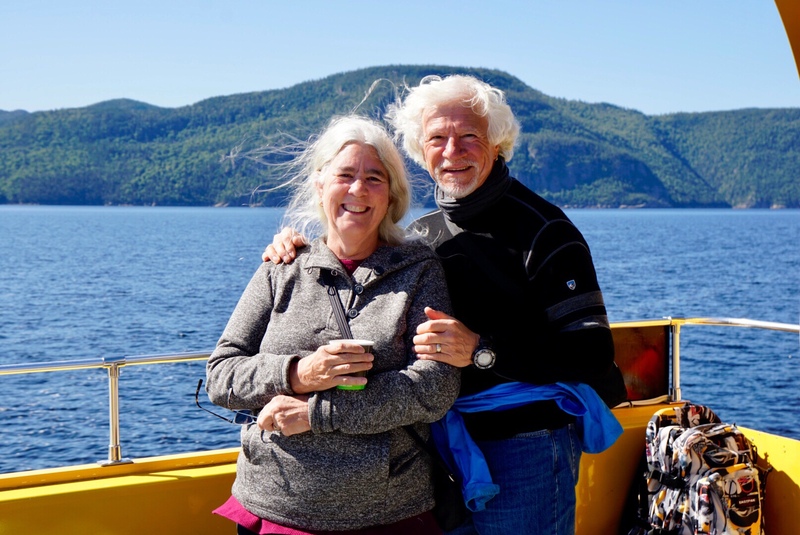 Our entire day was spent enjoying an excursion upon the waters of the Saguenay fjord. We boarded a very large Zodiac-like vessel, departing from the dock at camp on the west side of the fjord. We traveled north about an hour at an estimated 20-25 knots and were treated to views of the magnificent cliffs and hills that glaciers had carved out over 10,000 years ago. 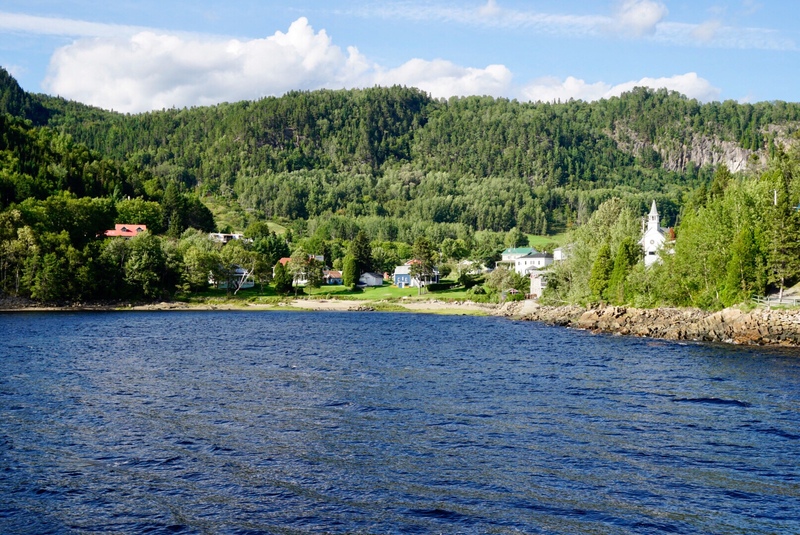 The fjord is fed by both a freshwater lake to the north, and tidal saltwater from the St. Lawrence to the south. The freshwater being lighter, in the central and southern reaches of the fjord it creates a freshwater layer that is approximately 50 feet deep. The saltwater remains below that layer, extending to the depths of the fjord which are up to 900 feet. A unique marine environment is presented that supports over 70 species of fresh and saltwater fish. This is considered the ice fishing capital of the world. In the winter folks come from near and far with their mobile ice huts and assemble in 3 “villages” upon the ice. The locations depend upon the fish they seek, some dropping their lines deep for ocean varieties and others shallower for freshwater species. In all, over 1,200 ice trailers are arranged in grid fashion upon the ice. 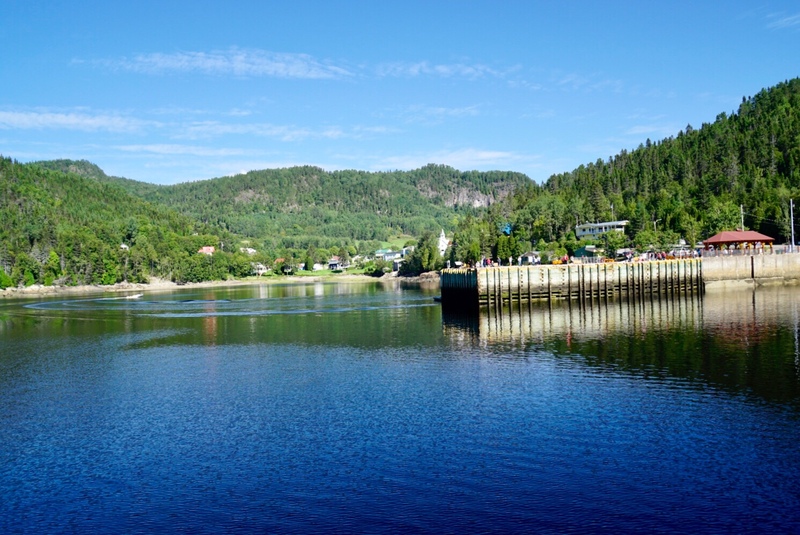 Approximately 20 years ago the waters of the Saguenay became so polluted that pregnant women were cautioned not to consume the fish. Beluga whales, Peregrine Falcons, and many other species were threatened, including the rarely found Greenland Shark, the second largest carnivore shark after the Great White. 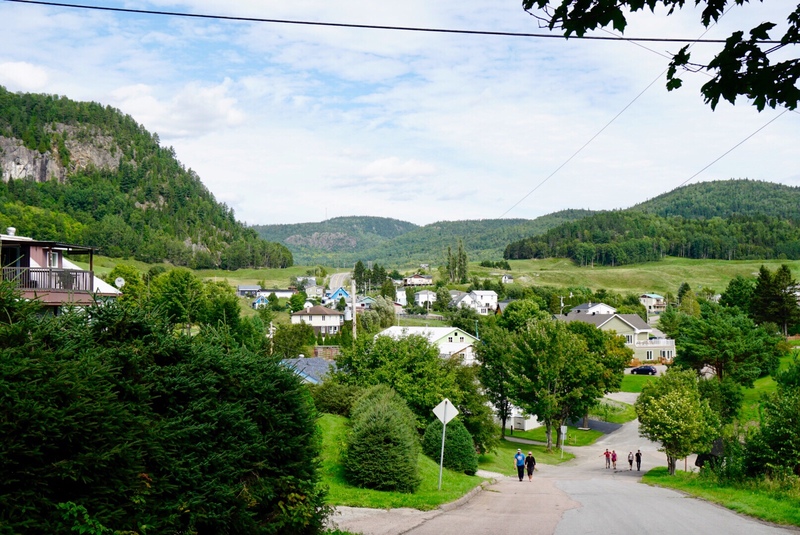 The imposition of environmental protection measures upon the municipalities and industries along the Saguenay have restored the waters and habitats, but it took 20 years for the pollutants to be “flushed”. Our boat arrived at the picturesque village of Santa-Rose-du-Nord. We disembarked and enjoyed a pleasant stroll through the town. 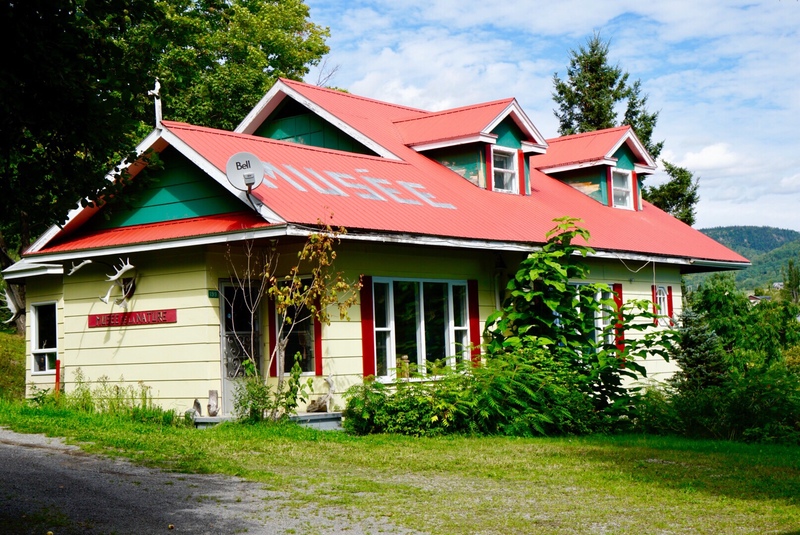 We encountered a most unusual “Nature Museum”, founded and operated by a most unusual woman. 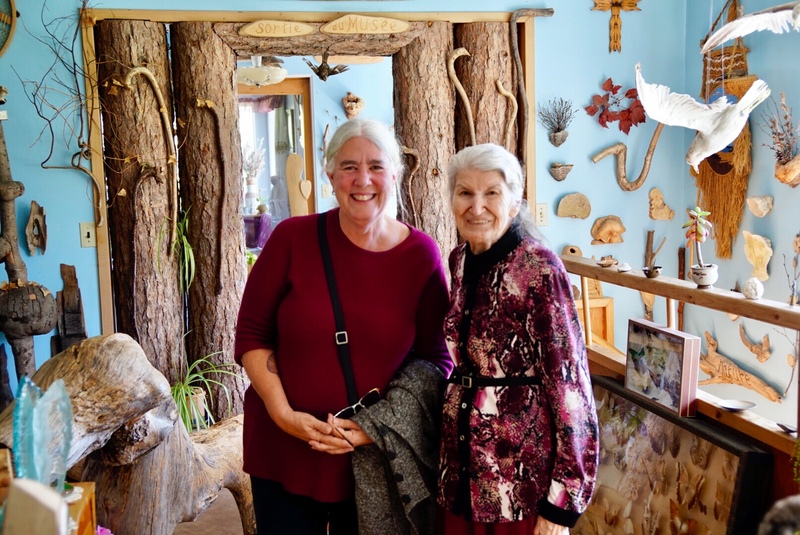 Approximately 50 years ago she began assembling an array of stuffed animals, samples of plants, molds, insects, and just about anything else that drew her fancy. The collection, which includes 2 stuffed Greenland Sharks, is contained in 6 rooms of her home. Ten dollars allowed us a tour and me permission to take 3 pictures. The experience was… odd. Continuing our wandering we came upon a quaint little restaurant located in the lower portion of an equally quaint home. Maison-Mina is staffed by the incredibly charming Mina and her gregarious husband who does double duty as the town’s mayor. $16.50 each provided us with a fantastic 4 course lunch. Christine enjoyed a roast pork while I had a local favorite which is a version of “shepherds pie” made with salmon. Mina spoke no English so Christine reveled in the opportunity to recall her French. I got by with sign language and smiles. The entire experience was priceless. We returned to camp later in the afternoon, in time to weather a brief evening rain shower, eat a light dinner, enjoy a campfire, and marvel at the clearing night sky. See if you can see the meteor that I captured with my camera! PS: Tomorrow I hike to the Via Ferrate des Geants. It is a 300 foot long open cable footbridge that hangs hundreds of feet above the valley below. The bridge is accessed during a 4 hour hike that includes portions where one must proceed by clinging to a series of cliff faces. The bridge is crossed one person at a time. Christine has decided that she will pass on this activity. Below is a telephoto image of the bridge I took from upon the waters of the fjord and some additional pictures taken during the cruise of the fjord. ← September 7, 2018. The Bell Curve of Life. Marvelous how you capture the essence of the area. Chris deserves a “medal.” You two have a way to make others enjoy your friendship. Kudos!! Exciting reading–must go back and reread to get it all. This has been most fascinating–it is on our side of the world. It has been exciting living this! Thanks Mom.. Love you. I’m with Christine! Good luck on that hike!! Love all your pictures. Mary, wait till you see the ones from the “hike”! Glad you and Christine are enjoying the sites as I am from the pictures. The cable bridge is questionable for me, but it certainly looks intriguing.